In isolation rooms the threat of infections is always top of mind. Not only does AccuVein lend itself to this environment by having no fans and being easy to clean at point of care, AccuVein now offers protective covers as an added safeguard. Isolation rooms present a unique challenge, with stringent procedures and protocols required. We’ve designed the AccuVein device to be isolation room-friendly with no fans or open vents. Devices with unprotected fans can blow air and present an infection risk. The AccuVein device can be easily wiped clean at the point of care. It doesn’t require special cleaning by bio-med and there are no ventilation grates that create exposed areas, that would make it difficult to properly clean. 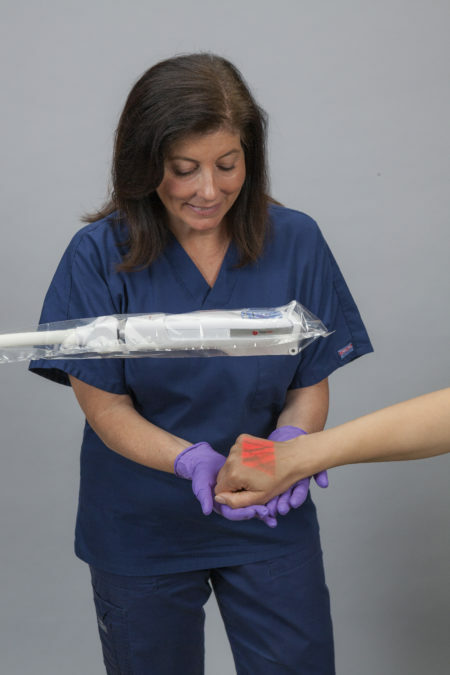 AccuVein now offers customized Protective Covers to help mitigate the infection control burden by making it easier to keep the device and stand clean between patients. These polypropylene barriers can be incorporated into procedures as standard of care in isolation settings. The added layer of protection covers both the device and hands-free stand without compromising the device’s crisp vein image. Learn more about AccuVein’s Protective Cover here. Easy to learn and use – No pre-use calibration or adjustments are necessary- it can be used immediately. Small size –The device fits in your hand and weighs only 10 ounces. Hands-free option –In situations that require hands-free use, the device can be placed in a wheeled hands-free accessory or one that quickly attaches to a chair or bedrail. No patient contact –Because the device has been designed to be non-contact, it may not have to be sterilized after every use. Works in light or dark –Use the device in light or darkly lit environments. Rechargeable battery –The device doesn’t need to be plugged into an electrical outlet. Movement tolerant –Because the device shows the veins in real time, when operated properly, the device can accommodate patient movement. As you know venipuncture can be particularly challenging in some patients and no environment is more challenging than isolation rooms. Given this challenge we think you’ll find vein illumination with AccuVein’s breakthrough device as essential for venipuncture as a stethoscope is for examining the heart and lungs. The benefits of the device for imaging facilities include increased nurse confidence, improved patient satisfaction and reduced delays. For more information on how the AccuVein vein locator can facilitate venipuncture, please contact us at +1 (816) 997-9400. Hemoglobin in the blood absorbs infrared light. When the device is held above the skin, veins appear noticeably different than the surrounding tissue. The vasculature shows up clearly on the skin’s surface, aiding in vein location.